So this is as far as we got before I caved. Until the overhead lights are off we can't set our own lighting and it's hard to know just how it will look with the nasty hall lights killing the colours. 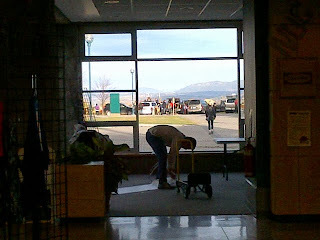 What I didn't quite catch in the photo was....see the catering guy in the white shirt and black pants to the far left? So I guess something is working? Textiles do have to be felt. To my friends doing shows this season - best wishes to you all for smooth travel, easy set up and lots of sales. 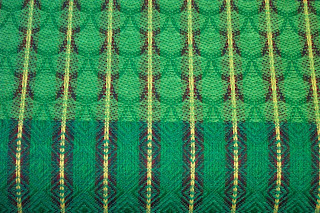 Since my post saying that all production from that day onward would be for 2014, I have finished the blue/green tea towel warp, including hemming most of the 17 towels from that warp, wound a white place mat warp, wove it off, cut and serged ready for wet finishing (sitting on the chair in the foreground) and wound a green place mat warp which will go onto the loom after lunch. Doug will go pressing this afternoon to catch up on what I've hemmed and the plan is to finish the green mats, wet finish both the white and the green so I can bring them along on the trip, hemming and pressing as I go. My little flat bed press will fit into the van and I can press in the hotel room in Vancouver as the room we have is a mini-suite with kitchenette. The weather report has been revised and they are now saying sunny and dry for Monday so I'm hoping they are correct. So much nicer to drive 450 miles when it isn't raining or - worse - snowing, especially this time of year when so many people still don't have winter tread on their vehicles. One of the things that self-employed people must do on a regular basis is define 'success'. Is this show successful enough to continue doing, or do I drop it? Is this line of scarves selling, or do I need to stop making it? Bottom line, am I making enough money to keep on doing what I'm doing or do I need to change my focus? So with no little regret, I will no longer be doing the Seattle Weaver's Guild show in October. Sales there have been dwindling, for a number of reasons, for the past few years. I will miss very much visiting with the people I've gotten to know there, but c'est la vie. There are all sorts of ways to define success. I remember once at a party talking to someone who was not an artist, who was moaning about how he could reduce the amount of tax he was paying to the government. After listening to him complain (or was that brag?) for several minutes I finally interrupted and said that I was hoping to one day earn enough money that I would have to pay taxes. Taxes are the contribution citizens of a country make in order to keep said country running smoothly and - I most fervently hope - compassionately. I have benefited from some of the services to low income people in the past and feel honoured to be a fully participating citizen of this country. Yes, including paying taxes. While I would like to be more financially solvent, by choosing to be a self-employed weaver I have had a life that I could not have dreamed of - travelled to places, met people and had experiences that never would have happened if I'd stayed in an office type job. So in many ways I can say that my career has succeeded in bringing me a lot of satisfaction. I have learned many lessons, some of them painful, some of them pleasant. But financially? In any other trade/profession, someone who has devoted this many years to perfecting her skills and knowledge would be making a whole lot more money. But I didn't go into this for the money. I wanted a life filled with creativity. I wanted to be able to set my own goals and schedule, including saying no to other's expectations - which is probably the hardest thing to learn. How I define success changes from month to month, day to day, sometimes moment to moment. It's my life. And life is a process. Any definition of success must take that into account. One of the things I have been doing lately is helping disperse the weaving, spinning, bobbin lace etc. stash of a friend currently in hospice. 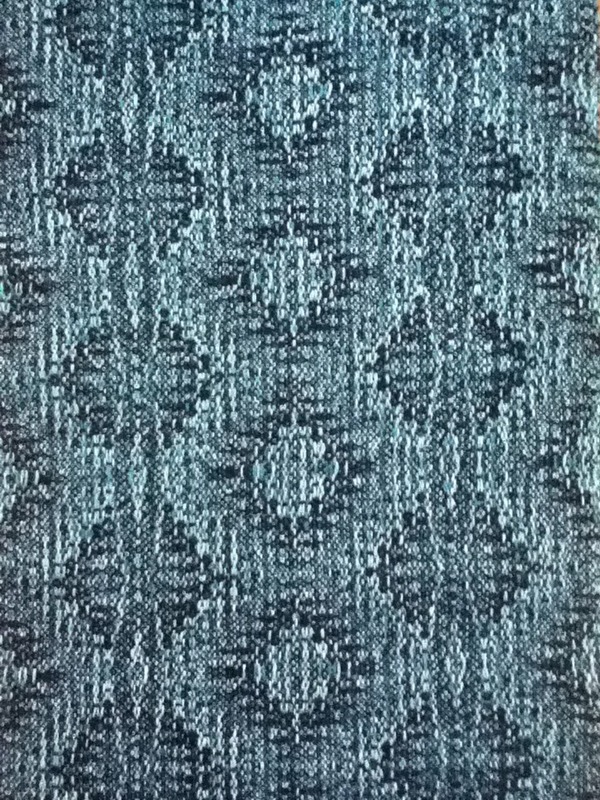 I have volunteered to auction off some items that don't have a ready market here but that I am pretty sure will be wanted by weavers from afar. Once I return from my shows - around the end of November, beginning of December, I will be setting up an auction on eBay for these items. Pattern and Loom by John Becker (including the supplemental booklet) will be one of the items. The book(s) are in very good condition - one small tear on the dust jacket, no bent pages, no signs of foxing. 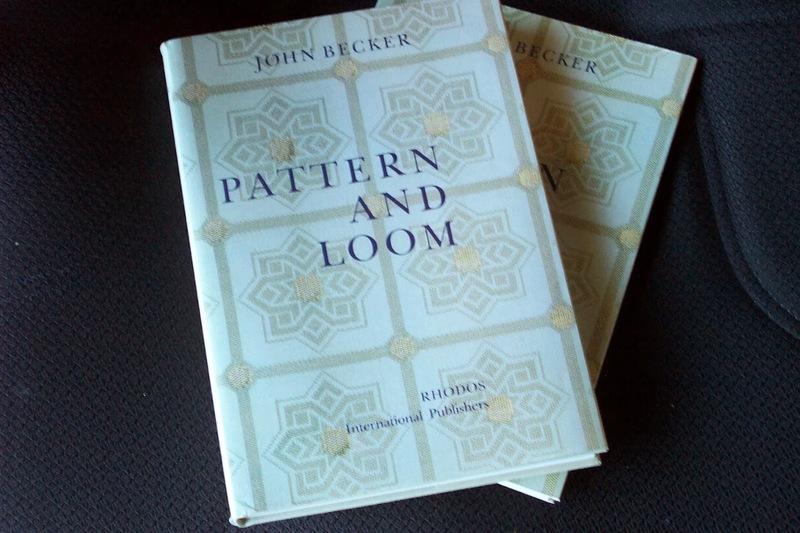 Along with the Becker book set there will be a rug and a macro-gauze by Peter Collingwood. As soon as I am able I will get photos of these for the auction. There are a number of other OP books that may be of interest to weavers but I just haven't got time to go through them right at the moment. In addition I will be auctioning off the guild Peter Collingwood rug. I should have taken a photo of the van yesterday after we picked up a load of (mostly) spinning equipment en route south. 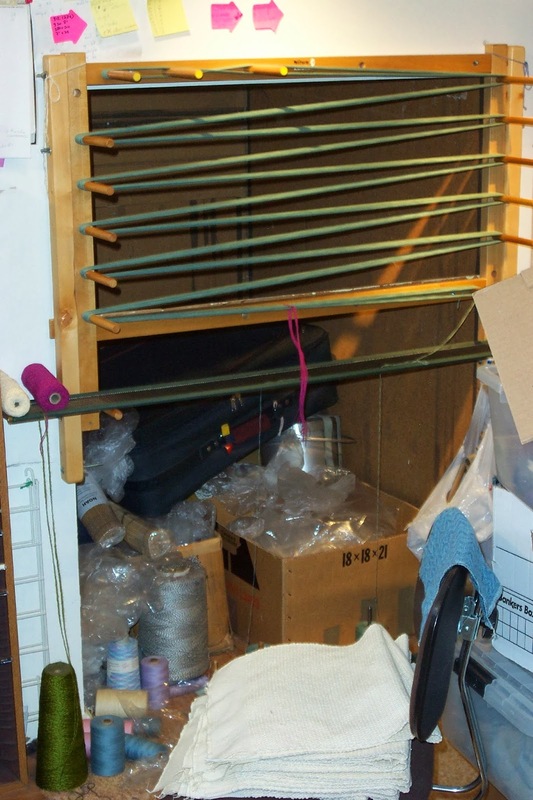 My friend loved spinning and weaving, and after a lifetime of collecting the tools she felt she needed, she had a house filled to bursting with equipment and materials. Sadly she has no family who is interested in it, so friends are helping her son find new homes for as much of it as possible. Meanwhile, Noreen and I are determined to keep this disbursement in mind and try to keep our own collections at least reasonable, if not simplified! Too often I hear of elderly weavers whose families have no idea about weaving equipment and wind up loading everything into a truck and taking it to the dump! Weavers and spinners need to have a studio executrix to assist their families in re-distributing their stashes. What arrangements have YOU made about your weaving/spinning stuff? That isn't our booth but our neighbour's. When I took this photo we were still getting stuff loaded into boxes and knocking the booth structure down. By the time I left Doug loading the van up (I came home to wash dishes so we'd have clean to eat dinner) he was the last one left at the curb. Even after fixing the sleying oopsie, the cloth doesn't look a whole lot different. I am hoping it will remain just as invisible after wet finishing, which is when these sorts of mistakes usually leap out at the eye. It was only when I had the 'right' shed open to insert a new weft that I noticed there was a problem. If I had never had that combination happen it never would have been discovered. 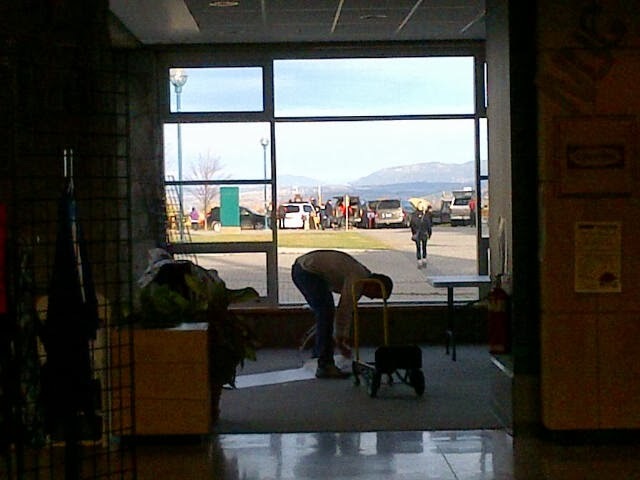 On another note, the first day of the UNBC Artisans of the North sale went fairly well. It was a good thing I made lots of place mats as they sold like mad. So much so I don't have enough for the rest of the sales and now I'm thinking that on those 3 days I have at home (plus the 3 days of Studio Fair) I might just have to stay home and weave as many more as I can fit into the time available. And on another note entirely (pun intended!) one of the things I inherited from my brother was a bunch of cassette tapes, compilations one of his friends had made in the late 70's early 80's. I've been weaving to the music of my young adulthood, feeling my brother very near. I'm sure he'd be rather surprised at the level of enjoyment I'm getting from these tapes, obsolete as the technology - and the music in some cases - is. In spite of 6 years difference in our ages (he was younger than me) we shared much the same taste in music and it was actually a bit of a surprise to discover that. And that there were very few duplicates when I combined his CD collection with mine. I knew I was low on tea towels; I did not realize just how low until the display was done. 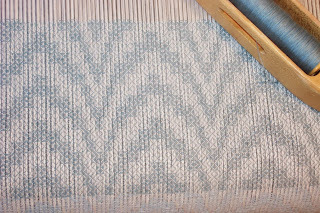 So I came home and wove a few more yards, enough to finish off the pale grey/blue cottolin weft and start the darker grey/blue in this 'fish scale' pattern. It looks much nicer on the other side, but the design relies on warp/weft contrast so I'm weaving it wrong way up to minimize the effort required to make the sheds. The cloth is also much nicer looking in real life. 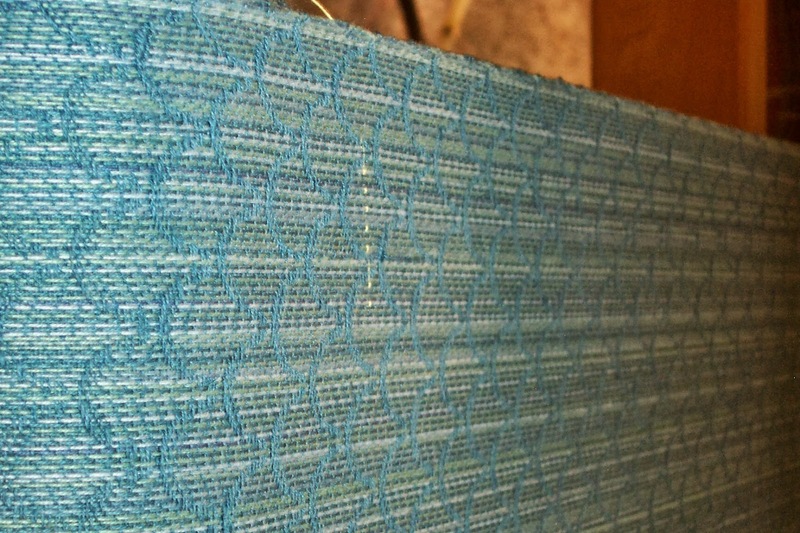 If you are at any of the shows I'll be doing this autumn, I might just have this warp done and in the booth. Or not. We'll see if I can get the round tuit working. "Wait, what? Year end? What are you talking about? It's only October! We haven't had Hallowe'en let alone Christmas!" I can hear you asking. The reality is, if you are a production weaver (potter, woodworker, etc.) relying on the autumn/Christmas sales for the majority of your income, your year pretty much ends one week before your first show. Unless you are saner than I am and don't book a bazillion shows back to back throughout October/November and December. ...is actually slated for next year's sales. As is all other work scheduled during the next 2.5 months. 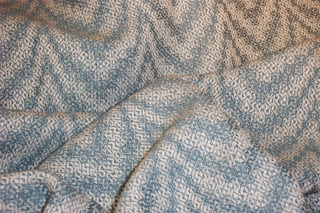 If I should get any of this warp woven, wet finished, hemmed and pressed in time for any of the upcoming sales, they will be a 'bonus'. But I am not putting any pressure on myself whatsoever to have them finished for this year. As soon as I get home from Calgary I will be plunged into finalizing the workshop in January at John C. Campbell Folk School . There is a faint possibility that I might do a workshop in Knoxville, TN after that but the time line is very tight so I don't know if we can pull it together or not. 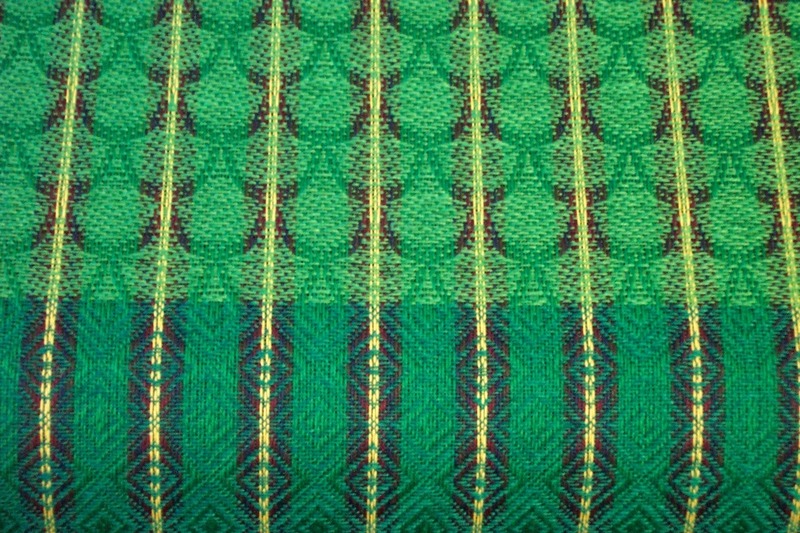 I have deadlines for the end of February for Handwoven submissions, one of which will require extensive 'sampling'. There is a Beginning Weaving Workshop here in Prince George in March and a workshop in Tacoma, WA in April plus the Vancouver Guild program following that. And over riding all of these deadlines is the big deadline, the one I can't miss, for the Next Big Project the first full week of May. Waves of peaks fading into the distance as we fly over the southern part of the province. I had a window seat and the day was mostly clear so I had a great view. On the last leg of the journey I got really lucky and was assigned a seat in row 4. When flying WestJet, that means extra leg room. Even better, there was no one else in the other two seats! I’m Nancy Curtiss, and I needed some help. 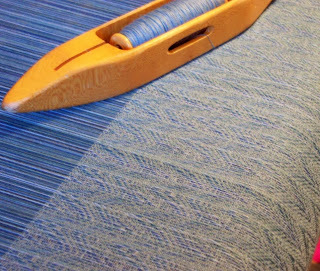 Well, as weavers, we know that we’re each a little warped, but when I attended the Eastern Great Lakes Fiber Conference in Chautauqua, New York over the weekend, I thought that I would mostly do just fine in my class called “The Efficient Weaver” with Laura Fry. 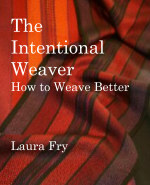 After all, Laura was going to teach us about how we could weave with minimal wear and tear on our bodies. Didn’t I have a canted bench? And I was all ready with my knee pad for tie-ups. Not much more to it, is there? Not so surprising to you, the answer was yes, there is more. Much more! and learned how to properly wind a stick shuttle. Notice the perfect figure eight? We learned a lot more than that, but you’ll have to attend Laura’s class or check out her You Tube videos for that. 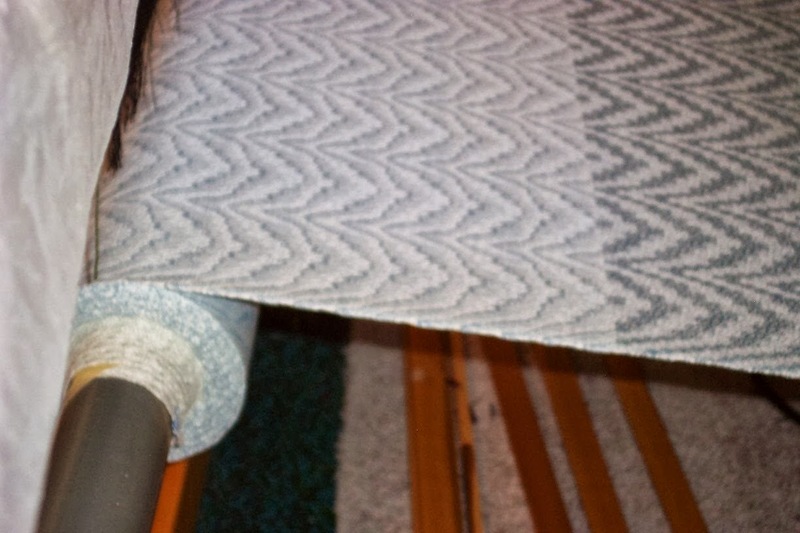 We gained knowledge of how our bodies affected our weaving experience, and the fact that our choices could inflict either pleasure or pain over the long haul really brought home the need for proper physical ergonomics. What I didn’t expect, and what I really needed, was mental ergonomics... getting my mind in the sweet spot to be willing to try something new – rather than staying in safe territory. When I showed up at the workshop, did I try an easy set up like this? ... which is like telling a knitter to come to a party to work on the middle of a complicated lace pattern. Not a good idea. Right then and there I realized that what was uncovered was my fear of complicated treadlings. For every skeleton tie-up there are many more that need to be what they are... and I was afraid to go near them. I unwittingly chose to limit my weaving choices. Now - medical science tells us that as we age we need to open our mental pathways by trying new things and by challenging our mental and physical acuity in different ways. With a fresh lesson in the ergonomics of the mind I open myself up to the hope of infinite possibilities that I started with in weaving, and with the right tools I can accomplish them once again. As a weaver I need to be unafraid to get down on the floor and change the tie-ups on my countermarch loom. I have aids to help me with that. I now know that I need to be unafraid to try complex treadling. That dance on the loom will help my dance through life. I think I’m ready for the next song. Chautauqua Institute is situated on extensive grounds near the western border of NY state. A hop away from OH and PA. The dorms were comfortable, the food decent, the companions delightful. With just 80 something people, there was a chance to meet most of them at one meal or another. There are many talented and prolific spinners, dyers, knitters, felters and weavers. There were many hand made garments to see and appreciate. The non-wearable exhibit was small but many excellent pieces on display. The fashion show had many lovely garments in it. Best of all, everyone seemed in good spirits, there was laughter and hugs. Today was another very full day with the workshop participants working more on their own and just three (I think!) lecture sessions. I threw so much information at them yesterday I wanted to review some of it and build on what had gone before. By the time we left this afternoon I think everyone was at the ready to weave stage so tomorrow they should make some progress on their warps. ...is over. Sort of. Tonight is the Open House from 7 to 8 pm. Today was intense as we walked through my method of dressing the loom. I just kept on rolling from 9 am until past 11:30 when I finally let people have a break. We covered a lot of ground in a short amount of time. This afternoon people mostly worked on their own with assistance when needed. 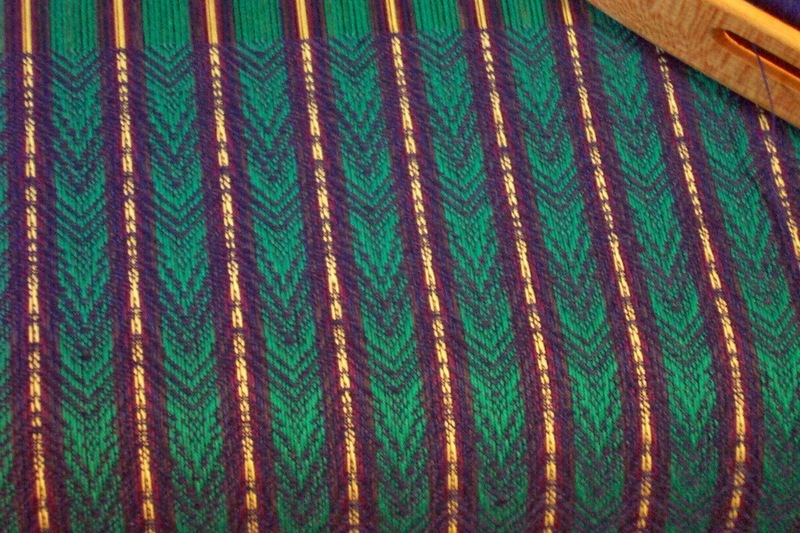 Some people are thinking a lot as they dress their looms, deciding what they want to adapt and what isn't pertinent to their approach to weaving. At the end we discussed the "thou shalt's" and some other issues. One person provided a learning opportunity by losing the cross. I showed how to pick it up again following the rough denting in the reed. Tomorrow I will demo lashing on, controlling beat and two shuttle weaving. And see what else people want to examine. Today is a day 'off', a day with no teaching, a day between a rather full day yesterday doing the Rochester, NY guild program and half day workshop and the start of the Eastern Great Lakes conference. A rare opportunity to go sight seeing, hoping to view some autumn splendour. 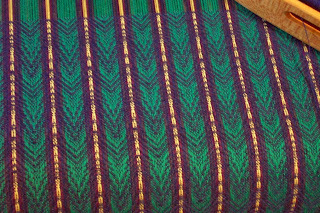 Visit an exhibit or two, the weaving centre. Meet more weavers. While the Internet is wonderful, allowing contact with other like minded people, also passionate about textiles, there is nothing like being able to meet in person, touch the textiles (when that is allowed) and experience it all for 'real'. Found that O'Hare appears to have free wifi so, with a three hour layover, I am catching up on Facebook, etc. The flights so far have been smooth sailing in spite of high wind in Vancouver. Mostly I read and struggled to stay alert. I don't tend to sleep while travelling unless I'm sick. But it wasn't all fun and games. I spent about an hour writing out a detailed outline for the Next Big Project. I will review that in a day or two to see if I have forgotten anything. Then I will start working on a task list. Drawing up a map, if you will, of what needs to happen to make the NBP be a success. Or, as close to a success as I can make it. As mentioned previously, this is not under my control in the way previous projects have been. I need to be aware of the needs and time table of the others involved. As usual I have been 'ambitious' and will be attempting to do too much in a very small amount of time. But I will have just that much time and no more so the better organized I am prior to the crew arriving the closer to success we will get. And so instead of winging it, I am making lists. Checking them twice. Trying not to be naughty but nice. Building a dream castle in the sky, then constructing a sturdy stairway to make sure I get there. Next Big Project is formally 'on' for the first (full) week of May next year. Deadline dragon huffing and puffing down the back of my neck....loads and loads of prep work to make it all happen. 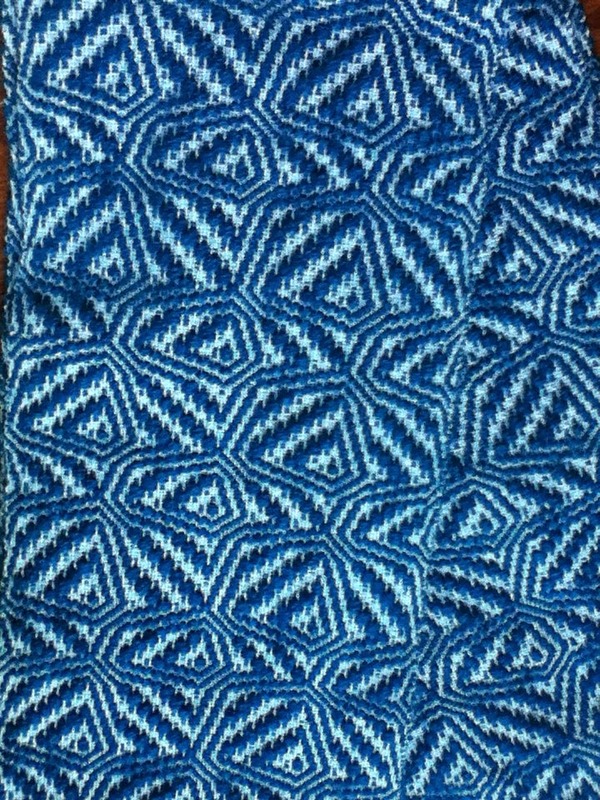 Here is one of the towels I did last week. After wet finishing the reed marks have pretty much disappeared even at 4 ends per dent. 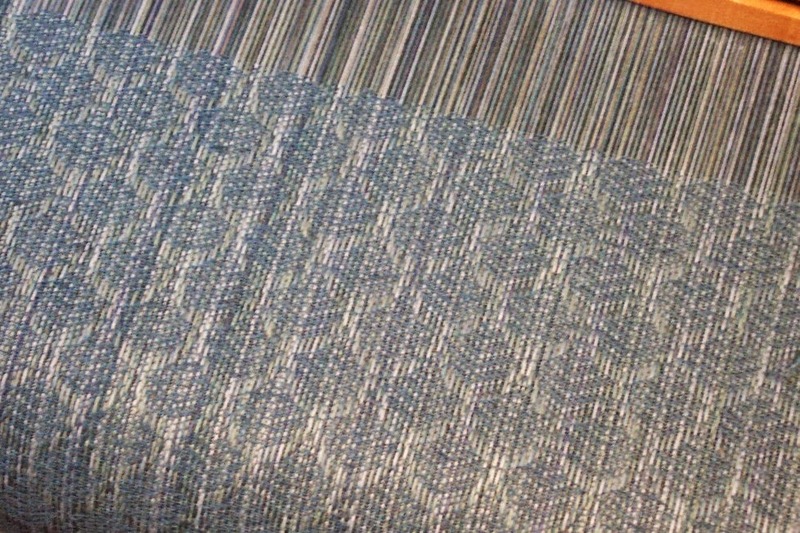 The next two warps are 30 epi and for several reasons, I switched to a 15 dent reed and 2 per dent. One more sleep. The weather is supposed to be fabulous in western NY state and I'm looking forward to seeing autumn in its splendour. 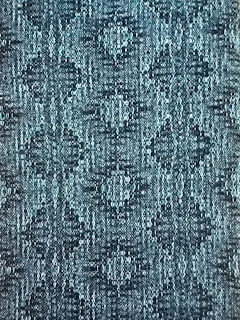 The teal warp is in the washing machine, I'm meeting a friend for lunch but before that I need an 'emergency' chiropractic treatment. This afternoon I will finish filling my suitcase in between loads of stuff for pressing, which Doug will do tomorrow. 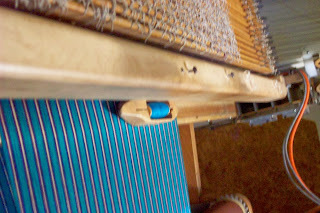 And threading the next warp, another blue-ish warp which actually is half green but doesn't look it. Or at least won't until the weft goes across it? So I will try to finish threading that, too. Another example of a little yellow going a long way - the colours are not 'true' in this photo - it looks much nicer in real life. ;) And there are just three yellow threads out of 30 in the repeat. Just two more sleeps and the whirlwind begins. I am working very hard to keep my inner dragon from breathing hot fumes down my back by not trying to cram one more thing, then one more thing, then one more thing into my schedule. And now that the current flock of deadlines are upon me, I've done about as much as I possibly can do to get ready for them, I am beginning to think about the next flock which will be coming home to roost just as soon as I get home. So one of the things I will likely be doing on the plane and in the airports (I have 3 hour lay overs in both Vancouver and Chicago) is making lists and outlines. I look at such things as road maps, charting the direction I want to go, allowing me to see potential road blocks and where detours might be taken instead. I suppose people might consider me ambitious. If that means I have a long list of things I want to do while I still can, then the word does apply. I just see so many interesting and fun things that I would like to experience. I don't want to waste a minute of whatever time has been allotted to me. 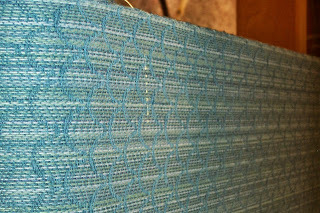 Ending of the darkest of the turquoise and beginning of the paler turquoise weft. 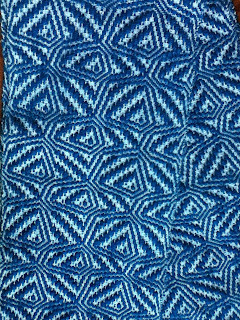 Another example of my weaving a cloth 'back side up'. 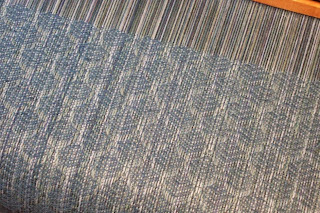 I couldn't get a good shot of the under side (the 'right' side) of the cloth on the loom - it will have to wait until it's been cut off. I am slowly picking my way (pun alert) through the cottolin. It feels very satisfying to see that small hill of tubes and left over pirns from the summer tops melting away. But there is still rather a lot of it left and it looks like it will take another warp to use it all up partly because of the colour combinations. I didn't want to just toss all the colours together like fruit salad but to make something as pleasing to my eye as possible. on faster and weave with ergonomics I'd advance from enjoy to love. hold my hands to make it more comfortable. height at a loom? Check. Dancing over the treadles? Check. been able to weave 4 and 5 yard warps before they get dusty. 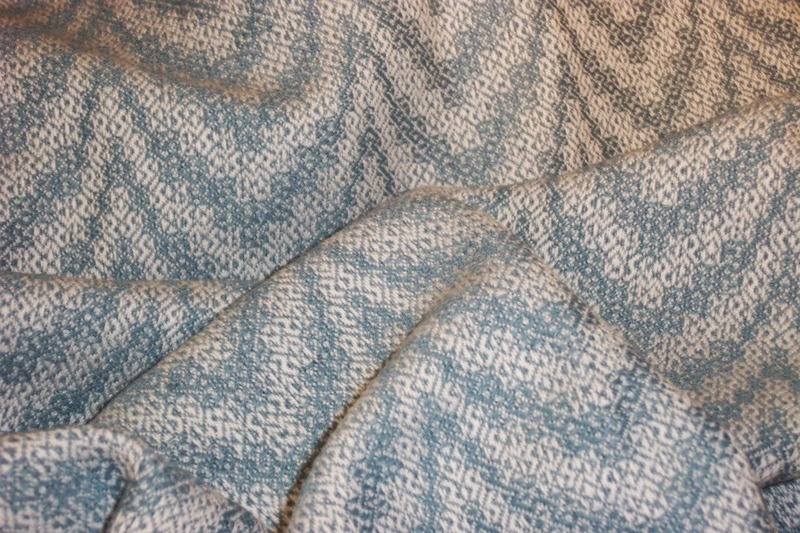 it won't be long before I'll be weaving that textile I'm dreaming about. It is stories like Mary's that keep me travelling long distances to teach. I live a long way from - well - everywhere. It's 500 miles (nearly) just to get to the border. And from the Pacific Northwest, it is a long way to the central part of the continent, never mind the east coast. The trip coming up next week is a case in point. My flight departs here at 7 am. I arrive in Buffalo at 11:30 PM. And I teach the next day. In Rochester. Coming home isn't much better - I leave Buffalo at 6:10 am arriving home in time for dinner. If all goes well. But then I get feedback like Mary's. And it is all worth it. Speaking of teaching, San Diego is interested in having me come down to southern California, perhaps in February of 2015. Of course the travel is expensive, so they are looking for other guilds to help share the cost of getting me down there. If there are guilds in the general area interested in having me at the same time, let me know and I can put you in touch with my contact. Help rescue me from winter weather? My looms are not pretty, they are functional. They are well used. They have 'scars'. The wood has gained patina from the sweat from my hands on the beater - literally. At times I feel a little embarrassed about the condition of my looms. The Leclerc was a rescue loom and has many 'scars' from how it was treated before I got it. Doug cleaned it up but most of the scars are cosmetic and I needed it in production not getting a beauty treatment so he just sanded the worst of the dings and scratches out of the wood - anything that might interfere with weaving. Since the Next Big Project will happen in my studio I am not going to be able to disguise the marks of being well used from public scrutiny and that bothered me - a little. Until I decided that my looms are a reflection of their lives, just like my body is a reflection of my life. I come with wrinkles and scars at my age and experience. So do my looms. It is so very satisfying when things are going relatively smoothly. I'm still having some issues with bobbins jamming in the shuttle cavity, but only two or three picks so I just pay attention to when the bobbin is getting to that point then try to finesse the shuttle handling to minimize the issue. And I'm doing well enough that I'm not going to change anything at this point. But I do forget how much play time there is with fine yarns. 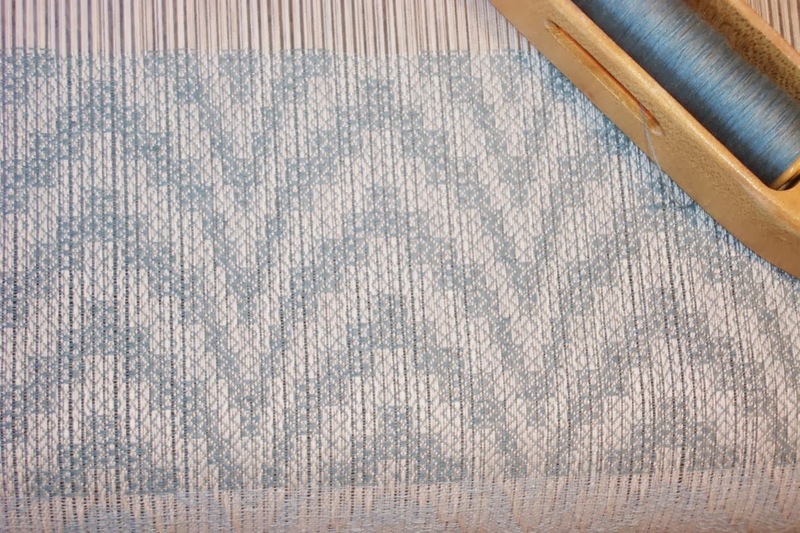 ;) This warp is satisfyingly close to completion - there are probably close to 15 yards on that beam. People sometimes describe me as a 'verbal' or 'storyteller' and I have to confess that is an accurate description of me. I do relate to words/stories and pithy comments that try to sum up situations - like "It isn't finished until it's wet finished." "If you can't be perfect, be consistent." And so on. One student said that after she got home from a class she found my voice had become an 'earworm' (a tune you can't seem to turn off) in her head. Last night a new weaver said she had been doing some research and learning on the internet and come across 'Laura-isms' that she recognized. When I first began weaving I had no idea that there would be something called the internet, emails, chat groups, cds, dvds. All that was stuff of science fiction.